Scrumpy & Western website. Made In Somerset from cider! The Scrumpy Bashers band page. Who Are The Scrumpy Bashers? 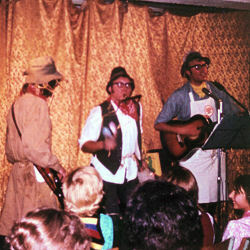 The Scrumpy Bashers were an Somerset-based folk/Scrumpy & Western band from the Midsomer Norton area performing in the mid-late 1970s. When not scrumpy-bashing, the band also performed as New Harmony. The Scrumpy Bashers performed around the area, playing pubs and clubs, church halls and village halls in the local towns and villages like Paulton, Whitchurch and Marksbury. Their set listing included various Adge Cutler & The Wurzels songs including Champion Dung Spreader, Hark At 'Ee Jacko, Wurple Diddle I Do, Chitterlings, Poor Poor Farmer, and When The Common Market Comes To Stanton Drew. 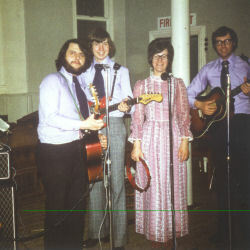 The founding line-up (c.1974) consisted of Eric Barge (vocals and percussion), Dave Barge (vocals and 12-string guitarr), Dave Gardner (bass), Bill Krouwel (vocals, guitar and harmonica) and Jennie Johnson (vocals and percussion). By the spring of 1975, the line-up had slimed to a four-piece consisting of Eric Barge (vocals and percussion), Dave Barge (vocals and 12-string guitar), Bill Krouwel (vocals, guitar and harmonica) and Dave Sampson (vocals and guitar). 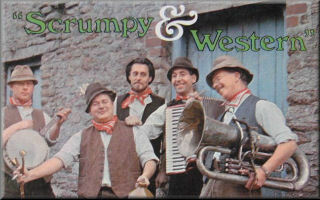 Guitarist Dave Sampson went on to join various rock and tribute bands (including The Rollin Clones) before returning to the Scrumpy & Western fold as Seth Pitt of The Mangledwurzels in 2005. 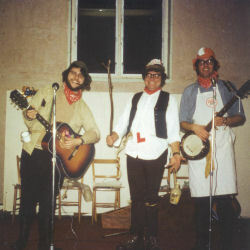 The Scrumpy Bashers (1974): Dave Gardner, Eric Barge & Dave Barge. Scrumpy Bashing (1974): Eric Barge, Bill Krouwel, Jennie Johnson, Dave Barge & Dave Gardner. 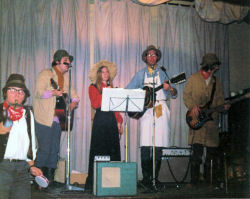 The Scrumpy Bashers as New Harmony (1975): Bill Krouwel, Dave Sampson, Helen Barge and Dave Barge. - Dave Sampson and Bill Krouwel for information received.